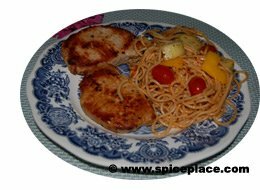 Want something that’s quick to make on a weeknight, and yet has great flavor and nutrition; then try this recipe for Cajun Seasoned Pork Chops. In only takes about 20 minutes to cook the chops, and meanwhile you’re making the pasta salad, which is a jiffy when made with Salad Supreme®. This recipe is so easy, I’m not sure if it really should be called a recipe! Place 1 tbsp of olive or canola oil in a non-stick skillet, and heat over medium heat for 1 minute. Reduce heat to low. Add the pork chops, and sprinkle with Cajun Seasoning. Cover pan, and cook 8 – 10 minutes, depending on thickness of the chops, until lightly browned. Thin chops made need less time. Turn, season other side with Cajun Seasoning and cook other side about 5 – 7 minutes. Serve with Pasta Salad (recipe below). Meanwhile, prepare the vegetables. Mix 1/2 cup Italian Salad Dressing with the Salad Supreme. When pasta is cooked to your desired liking, cool it under cold running water and place in a serving bowl large enough for the pasta, and vegetables. Add the vegetables to the pasta and mix. 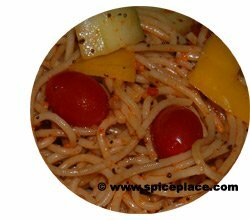 Pour the Salad Supreme/Italian Dressing seasoning over top of the pasta and toss gently to season pasta and vegetables. Sprinkle each serving with freshly grated Parmesan cheese. This is the recipe related to our Greek Marinated Chicken Recipe. Serve this Greek Salad with the baked Greek Marinated Chicken recipe or anytime you want a seasoned salad. It has a deliciously different taste from most salads. Mix all ingredients together and let sit for 15 minutes. Combine the following in a bowl then sprinkle the Greek Salad Dressing over top: Peel cucumber, and slice in half lengthwise. Cut into half-moon slices about 1/4 inch thick. Chop tomatoes into chunks. Dice an onion fine. Wash spring onions, and dice fine. Drain a can of Chick Peas. Enjoy. We enjoy having potato salad along with our summer barbecued foods like hamburgers, and chicken. Somehow the taste of potato salad blends with the barbecued foods. 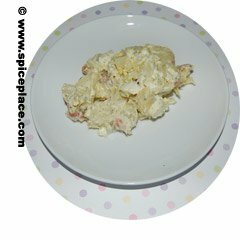 Occasionally we have found some prepared potato salad with a nice taste. But that’s hard to find as storage, preservatives, and mass production all are detrimental to the flavor. So we prefer, most of the time, to make our own potato salad. We know it’s fresh, limit the amount of salt we add, and enjoy knowing the potato salad was a result of our own efforts. We’ve never entered this recipe in a contest, but all of our friends rave over it when we serve the recipe at holiday weekend barbecues. Fill a large pot with water, and bring to a boil. Add the red skinned potatoes. Cook for 12 minutes, then add the 2 eggs in shell to make hard-boiled eggs. Cook for another 12 minutes. Drain, cool, then refrigerate the potatoes and eggs for 3 hours. Peel the potatoes if desired. Cut the potatoes into 1/2″ chunks and place in a large bowl. Peel the hard-boiled eggs, cut into 1/4″ slices, and then crumble the eggs over top of the potatoes. Combine the mayonnaise, cilantro, lemon juice, and white pepper in a Pyrex measuring cup. Mix a little dressing at a time into the potatoes. Keep adding more dressing until the potatoes are well coated with the mixture. Cover and refrigerate at least 1/2 hour. Mix and serve. Summer brings us lots of fresh fruits and vegetables from our garden. One of our favorite garden fruits is the tomato. There’s something special about eating the fruits of your own labor, and the tomatoes we grow in our garden are picked fresh from the vines and are loaded with flavor. We often just eat tomatoes like a peach, fresh from the vine, with a little fresh basil. While things are just getting going in our garden, the grocery stores are filling with fresh farm produce which is about as close to home raised as possible. Of course that depends on the quality of the produce buyer at your local grocer. The trend these days has been toward local grown produce, and grocery stores are pushing the quality of their produce offerings. But unless you live in the deep southern US, or in California, the odds are that tomatoes, and cucumbers sold in the store in June are not local and have been trucked in. 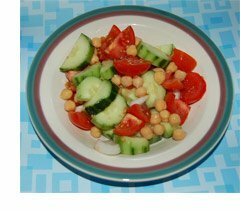 One of the simplest salads we enjoy with these two vegetables is Cucumber Tomato Salad. This recipe only takes about 5 minutes to prepare. Diced the tomatoes into bite sized pieces. Peel the cucumber, cut in have lengthwise, then slice into 3/8″ thick slices. You can leave a little peel on for added color. Peel and dice about 1/2 cup onion. 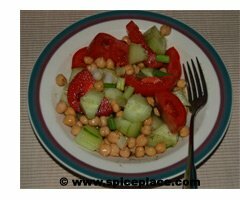 Combine the tomato, cucumber, and onion in a salad bowl. Add a little Italian Salad Dressing and mix well. Add the garbonzo beans if desired. Or serve on the side for others to add on there own. Do not refrigerate or you will destroy the flavor of the tomatoes. Serve immediately. Here’s a way to make a delicious pasta salad with ease. We make our Supreme Pasta Salad using whole wheat pasta which fits the lower carb craze, is nutritionally better than semolina pasta and is high in fiber. For all of those reasons we tend to lean toward whole wheat choices in all of our daily cooking. Cook pasta according to directions on the package. You can use any pasta that you find appealing. Add the Italian salad dressing to a 1 cup Pyrex measuring cup. Mix in McCormick Salad Supreme Seasoning. Mix until well blended. Drain the pasta, and place in a suitable sized bowl. Pour about half of the Salad Supreme / Salad Dressing mix over top, and mix. Then pour the remaining Salad Supreme mix over the pasta and mix until pasta is thoroughly covered. Make sure to mix gently so as not to damage pasta. Cover and refrigerate for 2 to 3 hours, mix, and serve cold. Here’s a picture of McCormick Salad Supreme Seasoning. It’s color is quite red, which comes from the paprika, but it also has Romano cheese, sesame seeds, red pepper and other spices. You can click on the image to see all of the product information in our store.